MAXIMUM OF 12 letters per line. MAXIMUM TWO lines of text, but can include a phone number, a house name, school name etc. Please be aware that the longer the name, the smaller the font! We recommend one word per line unless the name is very short. This stamp is self-inking, and the ink pad is Textile ink. 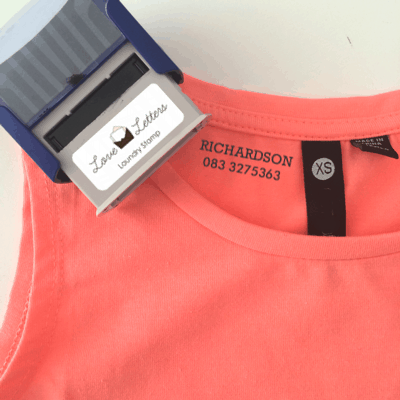 The ink may fade slightly after several washes, but then just please restamp. Bought one of these … what a win! Highly recommend! Are there different ink colours (white, etc) for dark coloured clothes?? hi Ken, sorry but no, only black at the moment. I would love to order your product. I would just like to know whether you sell the refillable ink pads for this stamp? If so, the cost. hi Nelia, yes we do – the set comes with an extra stamp pad (so 2 in the set) and then I have additional stock should you need it). Can you change the name each time you use it, or just one name per stamp? Also, where are you locates as school starts soon and would like to collect if possible. hi Rene, sorry I thought I had replied already! There is just one name per stamp.